Having goals is amazing. Goals enable you to grow as a person. Side note- check out Dream Year if you’re interesting in learning how to accomplish your #1 goal this year and feel good doing it. But I’m going to explain why having goals without a vision is really bad. The difference between goals and visions is super duper important. I was listening to Andrew Ferebee’s Knowledge For Men podcast, and Ferebee was interviewing Jordan Belfort, the man who the Wolf of Wall Street is based on. I was blown away by something Belfort said regarding goals vs. vision. In part, Belfot said, “too many people go around setting goals.” [Insert me saying to myself – “that’s me!”.] He then went on to say people who go around setting goals and accomplishing them without having a vision are usually negative because they hit a goal and then move on to the next one without having a higher purpose, which is demotivating. This was an “aha” moment for me. As a huge proponent of intentional living, I’m constantly setting and achieving goals. However, I never thought about a concrete vision for the goals I set (for my life, business, or anything else). 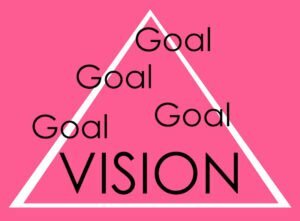 After searching around the web, I discovered there isn’t much out there on this topic and felt compelled to write on the distinction between goals and vision to encourage you to create a vision for yourself (life, career, or whatever else) in hopes that it will leave you happier overall. A goal is a specific target to achieve something. It’s the strategy and tactics you use to move toward your vision. You should set and achieve goals only that promote and are in line with your vision. This is why, if you don’t have a vision, goals alone can be defeating (i.e., without a vision, each goal is just something you’ve completed without a larger “why” in mind). Vision is your why. Vision gives something direction. It’s your desired future. Your vision includes what you believe in (your core values) and what you want in your future (what you want to be). It’s the powerful reason why you want to do something; your overarching purpose. It’s your passion and keeps you excited and motivated. It’s what inspires you to do whatever it is you want to do. For money, business, or career, your vision may be very specific. For your life and relationships, your vision may be broader. In either case, your vision should be clear because it is the foundation on which you build (as shown in the fancy image I created for this post 🙂 ). To create a vision, begin by identifying your core values, your passions, what you believe to be your purpose, and how you envision your life. From there, be more specific and remember to be clear. Your vision should embody your values and your view of the future without being too generic. Your vision can also change over time. The point is to have one so you know why you’re doing what you do, and you’re happier doing it. The same process applies when you’re creating a vision for any other aspect of your life, such as your career or business. Creating a vision can seem awkward or difficult, but it is definitely worth it. You’ll consider your higher purpose when setting and accomplishing your goals, which will leave you happier overall. Vision is your why. It’s the foundation for your goals. Use it to fuel you and define your goals. You need to have vision in order to be happy and fulfilled. And they both have their roles too 🙂 You need the goals to reach your vision or you’re just a dreamer! That’s true! You do need both! Ha! We are definitely on the same page today. Your vision is like the overall road map and your goals are the small journeys in between that get you there. Absolutely, Shannon! I couldn’t have said it better. Love this Natalie! I’d say vision should come first. Without that, the goals mean little. Like you said, you shoot from goal to goal without any real purpose. After awhile, you might think “why am I doing this” and then choose to give up because there is not a higher purpose for what you are doing. Brian @ Luke1428 recently posted…A Student Debate: Are There Absolute Truths About Money and Personal Finance? That is exactly what I think, too, Brian! I really hadn’t thought about it in this way before, so I’m so glad I am now. The “why” is so help and really essential! I have used a vision board for years. I find articulating a vision in words can be difficult. So, I find images that represent states of being that I want and make somewhat of a collage that changes over time as my wants and needs evolve. So far, it’s been powerful and has helped guide me to and through some pretty amazing experiences. I’m glad to hear this is helpful for you. I’ve heard about vision boards before, but I’ve never used one. I think this is something worth trying for me – thanks for sharing! I refer to it as purpose driven goals and it’s so important to know the “why” behind what you’re trying to accomplish. Well said! I absolutely agree, Kassandra! It’s something I wasn’t in the habit of doing until now. Thanks! I do not even know how I stopped up here, but I assumed this submit was great. I don’t know who you might be but certainly you’re going to a famous blogger when you are not already. I really appreciate this,now I know that there is a big difference in setting goals and achieving your vission.One can really shoot from goals to goals without a higher purpose in life only to realise that he or she has no vission on what she is doing.Well said.I love it. This post struck a chord with me. I’m heading over to check out that podcast next, in fact. I’ve had a monthly goal-setting challenge for over four years now, and have only recently felt like I was always just plugging along with no clear end-game in sight. I was browsing around for inspiration on creating a more concrete vision for my life when I found your post. So thank you! It’s been very helpful and I’ll be linking back to it when I make a blog post on creating a vision, if it’s okay with you. This is such a powerful idea. I have always been so intrigued by the idea of vision and goals and the effect they have on our lives. I am so happy you took the time to share this and touch upon the differences.